Image fusion is the process of combining image data from different sources into a single image. It is a vast subject that encompasses many methods, some of them very complicated . In this post we show a simple and straightforward way of doing it. By far the most common application in remote sensing is pansharpening, the process by which we can combine multispectral data with a co-registered panchromatic image of higher spatial resolution, normally acquired at the same time by the same satellite. The result is a multispectral image of higher spatial resolution than the original one. There are of course other important applications, such as the one described in this post, namely the merging of radar (Sentinel SAR) and optical (Landsat VNIR) imagery. This is a very powerful method because it enables us to combine the spectral information of an optical image with the texture of a radar image, creating a single image that is incredibly rich in information. James Ross Island group, northeastern Antarctic Peninsula. 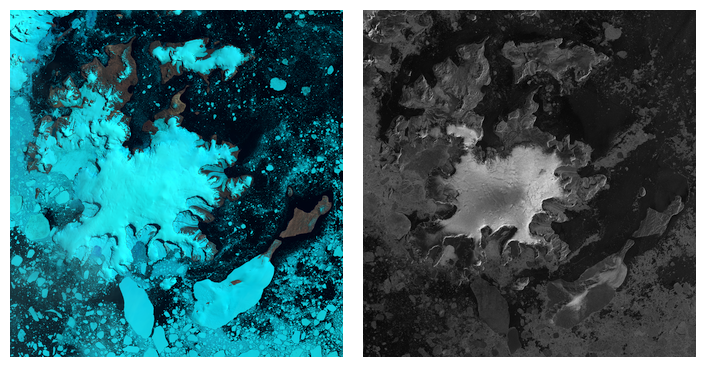 Landsat 8 OLI acquired 2017-02-04 (left), and Sentinel 1A SAR, acquired 2017-02-06 (right). 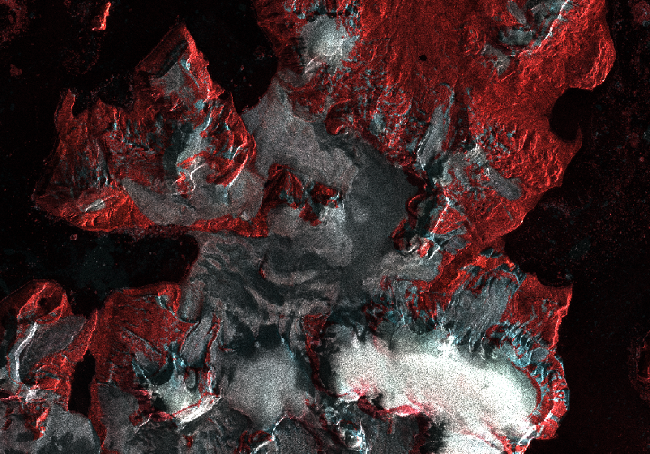 The Landsat image is a RGB combination of bands 6, 5 and 4 (mid-IR, near-IR and visible red). The Sentinel image is single band gray scale. These images have been preprocessed to have them cover exactly the same area, with the same pixel size (30 m in this example), and in the same coordinate reference system (UTM 21S). Both images are in GeoTIFF format and the data are stored as unsigned 16 bit integers, as is usual for these images. 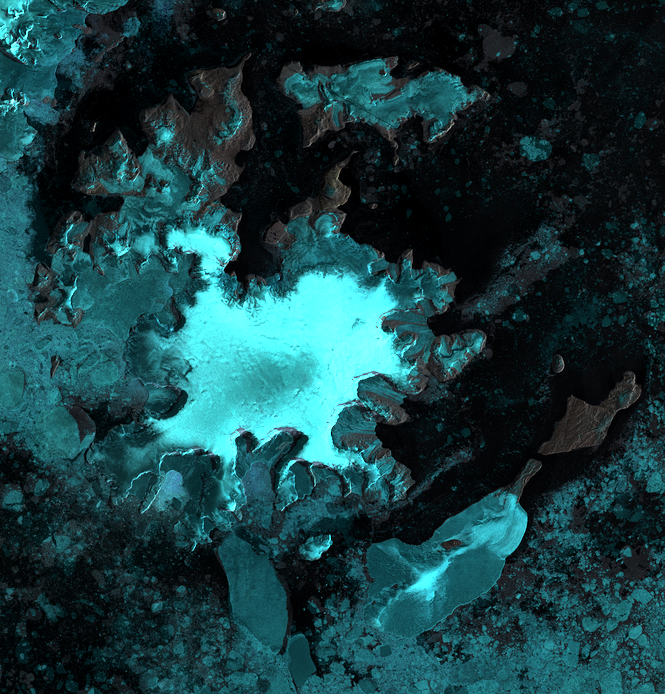 In the case of the Landsat 8 OLI image, the scene is already a RGB stack of bands 6, 5 and 4. ImageMagick operates directly in 16 bit, so no conversion to another data range is necessary and the result will likewise be a 16-bit image. Image multiplication will always darken an image, so the resulting image will always need some enhancement. The only trouble is that ImageMagick does not understand GeoTIFF and the resulting image will not have any geographic reference information. This is however easily solved using the command line tools listgeo and geotifcp, that come with the GeoTIFF library. James Ross Island group, northeastern Antarctic Peninsula. Image fusion of Landsat 8 OLI and Sentinel 1A SAR. One can, for example, see the region of dry snow at the top of the ice dome on James Ross Island, as well as differences in snow facies over the glaciers. The dark line running in the direction NW-SE is a result of the imperfect mosaic compilation of two Sentinel images acquired along the same track. Detail of James Ross Island, northeastern Antarctic Peninsula. Image fusion of Landsat 8 OLI and Sentinel 1A SAR. Imagemagick is a very sophisticated and powerful image processing package that sometimes goes under the radar of many remote sensing and GIS experts. It can operate from the command-line, either as stand alone of through scripts, and can also work with very large images as it has minimal demands on system memory (no GUI!). It is worth a look. As far as image processing goes, I always find an inherent joy in using simple methods to achieve useful and interesting results. There is power in simplicity. Pohl, Cle, and John L. Van Genderen. Multisensor image fusion in remote sensing: concepts, methods and applications. International journal of remote sensing 19.5 (1998): 823-854. Hello. I did nothing special to the images before multiplying them. The important things to think about are the usual ones that one considers in image processing. The images must have exactly same pixel size, covering exactly the same region, and be projected in exactly the same reference system. Rugged topography will always be problematic and cause mismatch. i did not understand, can you explain the detail? because sentinel 1 and landsat 8 the different units, so how to merge them into a common same units? Good question. Fusion, as explained in this post, is not a physically meaningful transformation. It may serve to enhance detail and thus facilitate interpretation. Therefore, we use just digital numbers and do not care about units. Hope this helps. I am new to remote sensing and require fusion of sentinel 1 and landsat 8 images for my dissertation so this is very useful. However I am confused as to where I am performing these commands, are they all in the command input? Hi Millie, thanks for your comment. These commands will be available in the Linux command console if you have the tools installed in your system: libGeoTIFF, GDAL and ImageMagick. I guess this is also the case in Windows, but I cannot say. There is much more to these procedures than it fits within a blog post. Pay attention to the fact that ImageMagick does not understand coordinate systems and that you will need to insert the georeference in the product image. Thanks again and good luck in your thesis. Hernán. Images do not have units per se, they are just scaled somehow. Just rescale the images to the same bit encoding, i.e. 16 bit integer or 32 bit float and it will be ok.